Part of the legacy of the London 2012 Olympic and Paralympic venues, was that they opened after the Games to be vibrant, well-used spaces for the local community. We were the first venue to open to the public on 27th July 2013, exactly one year on from the London 2012 Opening Ceremony. We're now London’s third largest arena and we're open to the public as a state-of-the-art gym and fitness facility. Since opening, we've welcomed 1 million visitors. Since opening to the public, we've made our mark on the national and international stage. 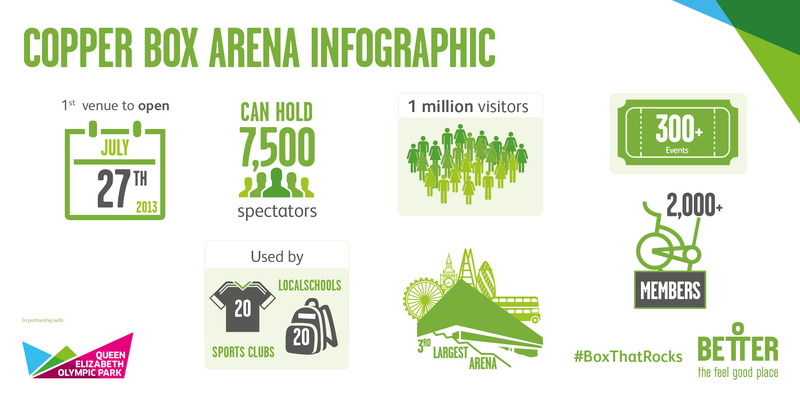 We're proud to have hosted a number of major sporting events including the Invictus Games, BT Sport World Wheelchair Rugby Challenge, a number of sell-out England Netball international games, international boxing tournaments and several England handball games. Looking ahead, we've been chosen as the hosts for three EuroBasket 2017 Qualification Series games, the 2016 National Taekwondo Championships and the opening match of the Vitality Netball International Series when the England Roses take on Jamaica’s Sunshine Girls. Plus, we've been transformed to host loads of different corporate events, such as product launches, conferences, exhibitions, awards shows and parties. Watch how the venue tranforms. As part of our London 2012 Legacy commitments, we deliver a diverse and plentiful grassroots sports programme for the local community. We're regularly used by more than 20 local sports clubs and 20 local schools as well as supporting a range of community groups, such as Salaam Peace and Fit4Sport. Plus, we're home to the London Lions basketball team, Leyton Women’s Netball team, London GD Handball Club, Baku United FC and London Titans Wheelchair Basketball Club.